Let's Stamp! : It's Christmas time! Well not quite, but one of hostesses this week wanted a Christmas themed workshop so I've been playing with my new and not so new stamp sets and colours. They both use the gorgeous Cherry Cobbler and ever so essential Old Olive. I can see these two colours being used for a large number of my Christmas cards this year! 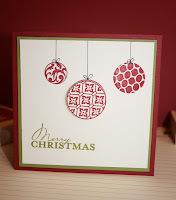 The first card is made using the un-Christmassy 'Circle Circus'. I decided that the circles would make lovely baubles. The middle bauble has been stamped twice - once directly onto the card and then onto a separate piece of card which was then punched out and mounted with dimensionals. The little ties were hand-drawn. A nice, quick card to make. 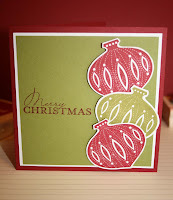 The second card is made with the new Christmas set 'Contempo Christmas'. Us demonstrators were lucky enough to be able to get this lovely set on pre-order before the catalalogue launch. The matching bauble punch will help to ensure that your Christmas cards are completed in next to no time! These little cards are really quick and simple to make, perfect when you've got lots of cards to send out to friends and family.